Martina Bergman-Österberg introduced a version of basketball in 1893 to her female students at the Physical Training College in Hampstead, London. The rules of the game were modified at the college over several years: the game moved outdoors and was played on grass; the baskets were replaced by rings that had nets; and in 1897 and 1899, rules from women's basketball in the United States were incorporated. Österberg's new sport acquired the name "net ball". The first codified rules of netball were published in 1901 by the Ling Association, later the Physical Education Association of the United Kingdom. From England, netball spread to other countries in the British Empire. Variations of the rules and even names for the sport arose in different areas: "women's (outdoor) basketball" arrived in Australia around 1900 and in New Zealand from 1906, while "netball" was being played in Jamaican schools by 1909. 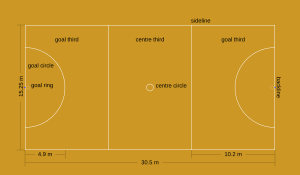 A netball court's dimensions. The court is divided into thirds and shooting circles are at each end. 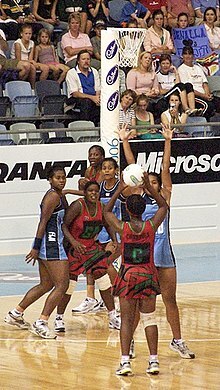 A pass takes place during a women's netball game in Fiji. Erin Bell from the New South Wales Swifts (red) prepares to shoot for a goal against the Melbourne Vixens. One study found that over 14 weeks of play about 5% of people develop an injury. The most common injury is of the ankle (usually lateral ligament ankle strain and less often an ankle fracture). Knee injuries were less common and included anterior cruciate ligament injuries. The main cause of these injuries is believed to be due to incorrect landing. One study found not warming-up as a risk factor. Hypermobility (having a range of motion beyond normal limits) has been associated with injuries in one small study. Higher grade players, in both senior and junior competitions, are more susceptible to injuries than lower grade players, due to the high intensity and rapid pace of the game. In October 2005, Australian captain Liz Ellis, tore her ACL in a match against New Zealand. This injury ruled her out of the chance to play at the 2006 Melbourne Commonwealth games. In October 2014, Casey Kopua ruptured the patella tendon in her left knee resulted in her missing up to 6 months of netball. ^ Numbers are taken where available from the 48 member nations of the International Federation of Netball Associations. (Cook Islands 1,000, Fiji 5,000, New Zealand 135,000, Papua New Guinea 10,000, Samoa 2,000, England 75,000, Scotland 1,800, Australia 330,000, Hong Kong 1,200,). No current numbers are available for Vanuatu, Botswana, Ghana, Kenya, Lesotha, Malawi, Namibia, South Africa, Swaziland, Tanzania, Uganda, Zimbabwe, Zambia, Gibraltar, Malta, Northern Ireland, Ireland, Wales, Switzerland, China, India, Malaysia, Republic of the Maldives, Pakistan, Sri Lanka, Thailand, Argentina, Antigua & Barbuda, Barbados, Bermuda, Canada, Cayman Islands, Grenada, Jamaica, Trinidad & Tobago, St. Lucia, St Vincent and the Grenadines and the United States. ^ "Member Associations". International Federation of Netball Associations. Archived from the original on 5 May 2011. Retrieved 10 May 2011. ^ "About Us". Cook Island Netball Association. Retrieved 10 May 2011. ^ "Members: Fiji". International Federation of Netball Associations. Archived from the original on 26 July 2011. Retrieved 10 May 2011. ^ "Netball New Zealand Organisation and Staff". Netball New Zealand. Retrieved 10 May 2011. ^ "Netball PNG Profile". Papua New Guinea Netball Association. Retrieved 10 May 2011. ^ "Netball History". Samoa Netball Association. Retrieved 10 May 2011. ^ "Membership Statistics". England Netball. Archived from the original on 2 October 2011. Retrieved 10 May 2011. ^ "About Us". Netball Scotland. Retrieved 10 May 2011. ^ "Netball Australia joins forces with DealsDirect.com.au". Netball Australia. 9 March 2010. Archived from the original on 10 March 2011. Retrieved 10 May 2011. ^ "About the association". Hong Kong Netball Association. Retrieved 10 May 2011. ^ a b c d e f g h Taylor, Tracy (November 2001). "Gendering Sport: The Development of Netball in Australia" (PDF). Sporting Traditions, Journal of the Australian Society for Sports History. 18 (1): 57–74. ^ a b c d e f International Federation of Netball Associations. "About IFNA". Archived from the original on 8 March 2011. Retrieved 23 August 2011. ^ a b Jobling, Ian; Barham, Pamela (November 1991). "The Development of Netball and the All-Australia Women's Basketball Association (AAWBBA): 1891–1939" (PDF). Sporting Traditions, Journal of the Australian Society for Sports History. 8 (1): 30–48. ^ a b England Netball. "History of England Netball (1891–2008)". Archived from the original on 19 July 2011. Retrieved 4 March 2011. ^ a b c d Netball New Zealand (3 August 2009). "History". Retrieved 8 March 2011. ^ a b Jamaica Netball Association. "The History of Netball". Archived from the original on 18 March 2011. Retrieved 13 March 2011. ^ School Sport Australia (2011). "Netball". Archived from the original on 9 March 2011. Retrieved 6 March 2011. ^ International Federation of Netball Associations (10 December 2010). "Netball Weekly Roundup". Archived from the original on 14 March 2011. Retrieved 5 March 2011. ^ International Federation of Netball Associations (15 June 2008). "History of Netball". Archived from the original on 6 March 2011. Retrieved 2 March 2011. ^ BNSC (11 May 2011). "Botswana Netball Association". BNSC. Retrieved 4 March 2011. ^ United States of America Netball Association (USANA), Inc. (2010). "History of the USANA". United States of America Netball Association. Archived from the original on 16 March 2011. Retrieved 13 March 2011. ^ Netball Singapore (2011). "About Us". Archived from the original on 1 March 2011. Retrieved 1 March 2011. ^ Netball Asia (2011). "Malaysia". Netball Asia. Archived from the original on 1 May 2011. Retrieved 24 March 2011. ^ "Norminshah Sabirin". Olympic Council of Malaysia. Archived from the original on 22 October 2011. ^ "Singapore victorious in 4 Nations Netball Cu". International Federation of Netball Associations. 23 December 2006. Archived from the original on 27 September 2011. Retrieved 22 June 2011. ^ a b c d Turk, Peter. "History of Men's Netball". International Mens and Mixed Netball Challenge Cup. Retrieved 24 August 2011. ^ Craig Francis (9 October 2003). "Humble start spawns global giant". CNN. ^ a b Netball Australia. "Court & venue specifications". Netball Australia. Archived from the original on 27 February 2011. Retrieved 2 March 2011. ^ International Netball (September 2006). "netball rules". International Netball. Retrieved 28 February 2011. ^ Indoor Netball Australia (2003). "Indoor Netball Australia Rule Book" (PDF). Retrieved 7 March 2011. ^ New Zealand Indoor Netball (January 2008). "7-a-side Indoor Netball Official Rule Book" (PDF). Archived from the original (PDF) on 24 July 2011. Retrieved 7 March 2011. ^ Action Indoor Sports (England). "Action Netball: 7 A-Side". Archived from the original on 7 July 2011. Retrieved 7 March 2011. ^ New Zealand Indoor Netball (October 2009). "Indoor Netball Official Rule Book (6-a-side)" (PDF). Archived from the original (PDF) on 24 July 2011. Retrieved 7 March 2011. ^ Planet Sport. "Indoor Netball at Planet Sports". Archived from the original on 24 July 2011. Retrieved 3 March 2011. ^ The Jamaica Star (12 January 2009). "Rhone excited about World Netball Series". The Jamaica Star (online). Archived from the original on 3 March 2011. Retrieved 1 March 2011. ^ Irvine, Mairi (12 January 2009). "New Style Netball to be Held in the UK". UK Sport. Retrieved 10 February 2009. ^ a b c d World Netball Series (2010). "Rules". Archived from the original on 18 July 2011. Retrieved 3 March 2011. ^ International Federation of Netball Associations (27 July 2009). "Fastnet: Official Rules Of The International Federation". Archived from the original on 26 July 2011. Retrieved 14 March 2011. ^ NSW Department of Sport & Recreation (1997). "Netball". Retrieved 3 March 2011. ^ a b Plaisted, Val (1989). "A comparison of the effectiveness of the modified with the traditional approach to junior netball" (PDF). Victoria University. Retrieved 4 March 2011. ^ a b c d BBC Sport Academy (11 April 2003). "Get playing high five netball!". BBC Sport Academy. Retrieved 27 February 2011. ^ a b East Grinstead High Fives Netball (17 November 2010). "Hi-5 Information". Archived from the original on 7 March 2011. Retrieved 4 March 2011. ^ a b "Full Members". International Federation of Netball Associations. Archived from the original on 2 June 2011. Retrieved 22 June 2011. ^ "Associate Members". International Federation of Netball Associations. Archived from the original on 24 June 2012. Retrieved 31 July 2012. ^ "IFNA Regional Federations". International Federation of Netball Associations. Archived from the original on 26 July 2011. Retrieved 24 May 2011. ^ International Federation of Netball Associations. "IFNA: Anti-doping". Archived from the original on 16 March 2011. Retrieved 23 March 2011. ^ Richard V. Mcgehee and Shirley H.M. Reekie (1999). "Using Sport Studies and Physical Activities to Internationalize the K-12 Curriculum". The Journal of Physical Education, Recreation & Dance. 70. ^ Western Argus (24 October 1922). "GAMES FOR GIRLS". Western Argus (1916–1938). Kalgoorlie, Western Australia: National Library of Australia. p. 1. Retrieved 1 March 2011. ^ BBC Sport (6 November 2008). "Campaign for netball at Olympics". BBC Sport. Retrieved 12 April 2010. ^ Commonwealth Games Federation (2014). "Spotlight on sport – netball". Retrieved 10 March 2018. ^ a b Clara Sinkala (6–14 September 2001). "Seychelles invited for netball tourney". Times of Zambia. Archived from the original on 12 November 2005. ^ Ellina Mhlanga (1 October 2009). "Zimbabwe: Mighty Warriors". The Herald. ^ "Netball moves towards professionalism". Supersport. 16 April 2011. ^ International Federation of Netball Associations (2010). "Regional Federations – Americas". Archived from the original on 26 July 2011. Retrieved 5 March 2011. ^ a b Enver Pemberton (15 April 2011). "St. Lucia Poised to Win Caribbean Netball Association U 16 Title". The St. Kitts-Nevis Observe. Archived from the original on 4 February 2013. ^ "Young Netballers March On". Jamaican Gleaner. 10 April 2008. Archived from the original on 8 October 2012. ^ "St Lucia to host AFNA championships in July". 27 May 2010. Retrieved 14 June 2011. ^ Darren Ng (12 June 2009). "Singapore to defend Asian Netball Championship title in Kuala Lumpur". Red Sports. ^ "Netball popularity on the rise in India: Federation president". The Hindu. 2 July 2010. ^ FIAT Netball Superleague. "Superleague home page". Archived from the original on 14 December 2009. Retrieved 2 March 2011. ^ England Netball (2010). "The FIAT Netball Superleague". Archived from the original on 12 January 2012. Retrieved 19 March 2011. ^ International Federation of Netball Associations (25 October 2006). "Sky Sports to show Netball Superleague". Archived from the original on 26 July 2011. Retrieved 19 March 2011. ^ "Netball misses selection for 2011 South Pacific Games". ABC Radio Australia. 15 September 2010. ^ Netball Australia (11 March 2007). "New look trans-Tasman netball competition". Netball Australia. Archived from the original on 1 September 2007. Retrieved 3 April 2008. ^ "New netball venture steps forward". Sportal. 21 December 2007. Archived from the original on 17 May 2009. Retrieved 22 December 2007. ^ Johannsen, Dana (29 March 2008). "Glitz and hype turn netball into money game". The New Zealand Herald. Retrieved 22 October 2011. ^ World Netball Championships 2011 Singapore (2011). "History". Archived from the original on 14 March 2011. Retrieved 3 March 2011. ^ "Samoa prepares for World netball series". Samoa Observer. 18 December 2008. Retrieved 5 February 2009. ^ International Federation of Netball Associations (14 January 2009). "Netball as never seen before". International Federation of Netball Associations. Archived from the original on 2 February 2009. Retrieved 6 February 2009. ^ Kaminjolo, Singayazi (12 November 2010). "Queens leave for Liverpool on Sunday". The Nation (Malawi). Archived from the original on 24 July 2011. Retrieved 19 November 2010. ^ International Federation of Netball Associations (3 April 2009). "Calling All Netball Fans!". International Federation of Netball Associations. Archived from the original on 14 March 2011. Retrieved 11 April 2009. ^ a b Newstalk ZB (2 December 2008). "Innovative World Series planned for next year". The New Zealand Herald. Retrieved 6 February 2009. ^ Marshall, Jane (5 February 2009). "Kiwis keen on novel netball variant". The Press. Retrieved 6 February 2009. ^ Smartt, Pam; Chalmers, David (29 January 2009). "Obstructing the goal? Hospitalisation for netball injury in New Zealand 2000–2005". The New Zealand Medical Journal. 122 (1288). Archived from the original on 1 September 2011. ^ Emily Benammar (13 October 2009). "'Fast' version of netball introduced in an effort to secure Olympic Games inclusion". Telegraph. London. ^ "Inclusion of Netball in the Olympic Games". Parliament of New South Wales. 21 September 2004. Archived from the original on 29 August 2011. Retrieved 24 June 2011. ^ Jones, Diane (February 2004). "Half the Story? Olympic Women on the ABC News Online" (PDF). Media International Australia incorporating Culture and Policy (110): 132–146. Retrieved 15 March 2011. ^ a b Shooting for Success (July 2004). "IFNA Recognition Confirmed" (PDF). International Federation of Netball Associations. Archived from the original (PDF) on 9 April 2011. Retrieved 24 March 2011. ^ a b c d e Hopper, D; Elliott, B; Lalor, J (1 December 1995). "A descriptive epidemiology of netball injuries during competition: a five year study". British Journal of Sports Medicine. 29 (4): 223–228. doi:10.1136/bjsm.29.4.223. ISSN 0306-3674. PMC 1332230. PMID 8808533. ^ a b McManus, A.; Stevenson, M.R. ; Finch, C.F. (1 January 2006). "Incidence and risk factors for injury in non-elite netball". Journal of Science and Medicine in Sport. 9 (1–2): 119. doi:10.1016/j.jsams.2006.03.005. PMID 16621712. ^ Smith, R.; Damodaran, A. K.; Swaminathan, S.; Campbell, R.; Barnsley, L. (1 September 2005). "Hypermobility and sports injuries in junior netball players". British Journal of Sports Medicine. 39 (9): 628–631. doi:10.1136/bjsm.2004.015271. ISSN 1473-0480. PMC 1725309. PMID 16118300. ^ "Kopua's injury blow for Magic". Archived from the original on 20 January 2015. Retrieved 3 September 2015. Altman, Dennis (2001). "Global Gaze / Global Gays". In Blasius, Mark (ed.). Sexual identities, queer politics. University Press. pp. 96–117. ISBN 0-691-05866-0. OCLC 439890293. Massoa, Prisca; Fasting, Kari (December 2002). "Women and sport in Tanzania". In Pfister, Gertrud; Hartmann-Tews, Ilse (eds.). Sport and Women: Social Issues in International Perspective. International Society for Comparative Physical Education & Sport. Routledge. ISBN 0-415-24628-8. OCLC 50204306. McGrath, Alicia C.; Ozanne-Smith, Joan (May 1998). Attacking the Goal of Netball Injury Prevention: A Review of Literature. Report No. 130. Monash University Accident Research Centre. CiteSeerX 10.1.1.129.6986. Retrieved 15 March 2014. Scully, Deidre; Clarke, Jackie (July 1997). "Gender Issues in Sports Participation". In Kremer, John; Ogle, Saun; Trew, Karen (eds.). Young people's involvement in sport. London: Routledge. ISBN 978-0-415-16650-8. OCLC 36225511. Symons, Carol; Hemphill, Dennis (November 2006). "Netball and transgender participation". In Caudwell, Jayne (ed.). Sport, sexualities and queer/theory. Routledge Critical Studies in Sport. London: Routledge. pp. 122–124. ISBN 0-415-36761-1. OCLC 66392801. Thompson, Shona M. (December 2002). "Women and sport in New Zealand". In Pfister, Gertrud; Hartmann-Tews, Ilse (eds.). Sport and Women: Social Issues in International Perspective. International Society for Comparative Physical Education & Sport. New York: Routledge. ISBN 0-415-24628-8. OCLC 50204306. This page was last edited on 22 April 2019, at 18:30 (UTC).